Of all the ancient sites and monuments I’ve featured on The Hazel Tree, perhaps none has a more remote or spectacular setting than the Kilchoan Cross at Inverie. A short distance to the south-east of Inverie is an old graveyard, now very much overgrown, close to where a small church once stood. Above the tall stems of reeds and grasses a stone cross rears its ancient head. The nearby church was dedicated to St Comgan, a prince of Leinster who left Ireland in 717 AD in order to spread the word of the gospels. In fact, the name ‘Kilchoan’ comes from the Gaelic ‘cille’, meaning ‘church’, and Comgan’s own name in the suffix ‘Choan’. St Comgan was only one of many such missionaries: the best known is St Columba, who founded the Abbey on Iona. Nothing now remains of the church, but some grave slabs nearby, curiously kite-shaped and carved with a simple cross, suggest a link with Dál Riata, the ancient Gaelic kingdom that encompassed much of western Scotland in the 6th and 7th centuries AD. These slabs are partly hidden in the undergrowth. What strikes you first about the Kilchoan Cross is not its age, although its features are certainly weather-worn and the carvings are partly obscured by lichen. It’s the small, square-shaped hole in the middle. For me – and, more importantly, for better informed historians – this suggests an origin that has little to do with Christianity. Somehow, it’s the look of it that tells you. Carvings that have been identified on the cross head include a galley with its sail furled, which you may be able to make out in the photo (I think it is in the centre, above the hole). On the pillar of the cross a sword is carved, and the single-handed design of this weapon is what dates the cross – or at least, its carvings – to the 15th century. Unlike many monuments of the same era, there are no traces of an inter-connecting ring between the four arms, like a typical Celtic cross. And there’s a short projection or flange on the upper ‘arm’: what’s this for? Was it made to avoid cutting off the top of the galley? On the back of the cross is a carving of a man on horseback, and – in the opinion of some historians – a depiction of Daniel in the lions’ den. Some of the sources I’m referring to are quite old, and I am sure that this scene would have been much more evident at the time of inspection. You’d need a sharp eye and a lively imagination to make it out now. But somehow my eye is drawn back to the intriguing central hole; it’s almost as if the cross has an ‘eye’ of its own. The historian Denis Rixson considers that pierced stones held an important place in pre-Christian rituals, when groups of people would make a journey around various important sites, maybe leaving tokens in the way that we still drop pennies in a wishing well, and sometimes putting their hand (or even their head) inside a custom-made hole or hollow. In a couple of cases, namely a pierced stone at Kilmartin in Argyll and another at Stenness on Orkney, a betrothed couple would link hands through the hole in order to be pronounced man and wife. There’s no such story attached to Kilchoan, and its carvings at least date it to a later time; but that doesn’t necessarily exclude it. I guess if you were Indiana Jones, you’d wait for a shaft of sunlight to beam through the hole at midsummer sunrise, which would guide you to a long-lost relic – or a nest of vipers! Taking a more practical line, perhaps something like a wooden pole might have slotted through there, for some unimaginable ritual purpose or even to ease its transport. What if the stone is, in fact, a much older monument that has been modified with the passing of time, first with the central hole and then with Christian carvings – even the cross-head shaping – to satisfy the evolving beliefs of the local people? 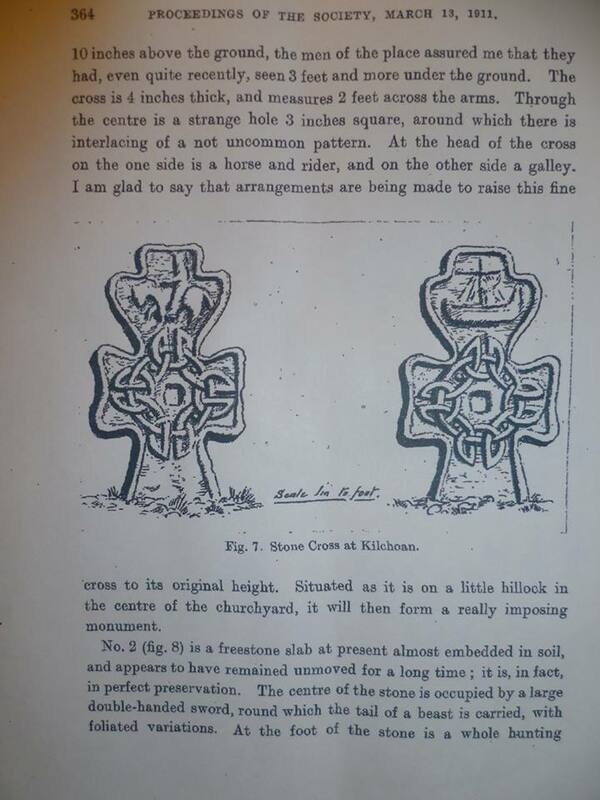 However much you stare at the Kilchoan Cross, it’s not going to reveal its secrets. All we can do is speculate. And that is ‘history’ at its best! The Kilchoan Estate has kindly shown me photographs of three pages from a document which I imagine to be a report by an archaeological or historical society. My thanks to the Kilchoan Estate for this information. ‘Knoydart – A History’ by Denix Rixson, pub. Birlinn Ltd.
Footnote: The Royal Commission on the Ancient and Historical Monuments of Scotland considers that the cross originates from the mid 16th century or later; Denis Rixson believes it is of an earlier date. The RCAHMS also states that the cross has been moved from its original site, into the centre of the graveyard. Burials were still being made in the graveyard until the late 19th century. What a strangely weird and beautiful monument. Jo. Thanks for sharing. Thank you, Susan. It is unlike anything I’ve seen. Earlier photos (I mean, taken about 20 years ago) show the carvings in a much better condition. It makes me want to go there. To me the entire stone looks like a sword piercing the earth. Of course that still doesn’t explain the hole, but that was it looks like to me. You’re absolutely right – it does look like a sword, and especially considering the angle at which it’s leaning. Thanks for your comment! That’s a very interesting theory – thank you for the link, I will have a read of that! Ach, this is wonderful! Thank you for the marvelous photos and history! Thank you for posting this material. My gr-gr-GF was born in the Knoydart in 1840 as were his parents before him. Victims of the Clearances, they emmigrated to Canada in 1850. It boggles my mind that this cross was already a well established artifact in their backyard. I wonder if it was as much a source of intrigue to them as it is to us? That’s amazing, and I’m very glad to hear from you! It certainly would have been a feature for them, and the graveyard that it stands in would still have been in use at that time – I don’t know if the church was still standing. Thank you very much for commenting! The intriguing cross, the strange history, the rugged landscape and that magnificent blue sky are all making me want to visit Inverie. I know what you mean about needing a lively imagination to see things carved on old stones, it’s a pity they weather the way they do, but these photos are lovely and you can’t help but wonder about the secrets the stone holds. It’s certainly a wonderful place to be on a fine day. Pretty bleak in winter, but spectacular all the same. I just love old stones (and old buildings) like these – off the beaten track, and pretty much all that we know about them is lost to memory. What a mystical piece. I love your photos, especially the final one with the sun shining through the hole. Perhaps that signified the pull between shadow and light, evil and good? The weathering of the stone is amazing. I feel knee deep in history now. That’s an interesting idea, Lyn. Another commenter suggested that the hole might have held a precious relic of some sort. It would be wonderful to know, but what makes it so magical is that we never will! I visited the cross last week, as part of a week spent in this magical place, and found it most intriguing. Can I please ask at what time of year (?February) and day the photo was taken with the sun shining through the central hole? Where did it shine to on the other side? I have come across trothing or trysting stones with holes in, but they are not usually cruciform. Hi Clare, thanks for your enquiry. I hope you had a lovely week on Knoydart! The pic was taken at 3.46 pm on 21st February 2013. Since I can’t attach a map here, I will email you with a map that roughly shows the direction of the sun – hope this is of help! Kind regards, Jo. Came here from Journeys to Scotland – such a fascinating cross. If only the stones could speak! That’s good, and yes it really is fascinating! I think the same way myself, very often.